While the world's indigenous people are estimated at only around 370 million, or about 5 percent of the global population, they reportedly speak 95 percent of the world's languages. Yet they remain virtually unrepresented both politically and economically. Often, their lives and livelihoods are under threat from the competing economic needs of others living within their countries. But with increased attention from the United Nations, nonprofit organizations, and volunteer groups, greater awareness and understanding of the rights of indigenous people have emerged at the international level, providing them with some legal standing. 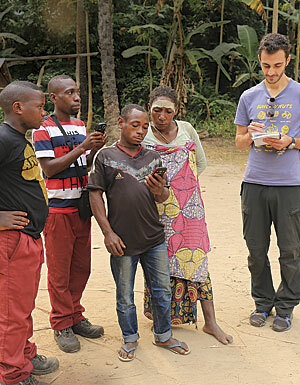 Recognizing the ability of GIS technology to underpin citizen-based initiatives, Muki Haklay, professor of geographical information science at University College London (UCL), and Jerome Lewis, a lecturer of anthropology at UCL, formed the Extreme Citizen Science (ExCiteS) research group. ExCiteS is an interdisciplinary team composed of researchers, artists, and information and communication technology specialists that work with local people to better engage them in the process of citizen science through participation. "Extreme Citizen Science is a bottom-up practice that takes into consideration local needs, practices, and cultures," said ExCiteS research associate Patrick Rickles. "We work with residents to understand their needs and problems and help them develop solutions and transform their communities using innovative GIS applications. Results are shared with the community and interested parties, based on the sensitivity of the data and consent from participants, so that the project can develop as they see fit." Since 1994, Lewis has worked as an anthropologist with the Mbendjele, a nonliterate group of indigenous hunting and gathering people living in the Republic of the Congo. "Logging has been imposed over the lands of indigenous people across the region," said Lewis. "The legal system hardly recognizes the rights of local people." One of the local logging companies, Congolaise Industrielle des Bois, chose in 2006 to become Forest Stewardship Council certified, which identifies the company as environmentally and socially sustainable in its forestry operations. Part of the certification requires that the company respect the rights and resources of indigenous and local forest people. But when Congolaise Industrielle des Bois asked the Mbendjele to indicate their territories on a map so the logging company could avoid interfering with resources that were critical to the community's livelihood, literacy issues and cultural differences became considerable obstacles. Because the Mbendjele do not have a written language, members of the tribe were unable to interpret the map. Furthermore, the Mbendjele have an ideological aversion to land ownership, rejecting the concept altogether. They see their forestland as an extension of themselves. "An Mbendjele loves the forest as he loves his own body," said Lewis. To help clear up these communication issues, Lewis developed an icon-driven mapping application that the Mbendjele could use to map their key resources and protect them from logging-induced damage. While this application worked for several years, by 2013 the software and hardware were outdated. So Lewis and Haklay founded the ExCiteS team to create more durable mapping solutions for the Mbendjele and other indigenous peoples. With support from Esri, team members Matthias Stevens, Michalis Vitos, Julia Altenbuchner, Gill Conquest, and Carolina Comandulli began to develop Sapelli, a cell phone-based mobile data collection platform. Named after the mahogany-like Sapelli tree that grows in the Congolese rainforest (one of the main points of conflict between local communities and logging companies, as it is valued by both), Sapelli is an open-source Android app driven by pictogram decision trees. 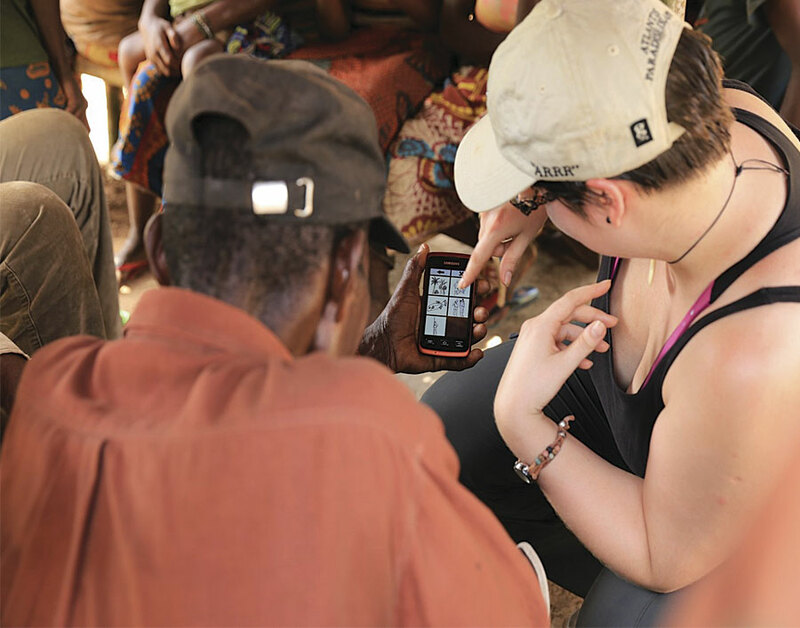 Although few tribal members had seen a cell phone before the ExCiteS team introduced the technology to the project, the researchers ensured that local populations could easily understand how to use the application. 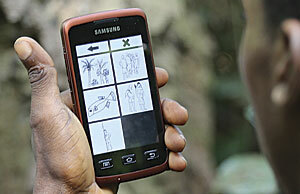 After designing the initial pictograms, the ExCiteS researchers sought feedback from the Mbendjele and other users in the area. The team then altered the designs accordingly. Using the now-intuitive application, the Mbendjele mapped their tribal lands and highlighted trees that were important to them, usually for medicinal reasons or religious significance. Congolaise Industrielle des Bois then verified the trees that the tribe documented as valuable and removed them from its cutting schedule. The tribe also documented illegal logging and poaching activities. Because cell phone signal coverage is limited in Mbendjele tribal lands, the Sapelli app is programmed to transfer and reassemble very small packets of information at a time whenever possible. It uses compressed text messages to transfer key data, such as time stamps and selected points on the decision tree, back to the ExCiteS group. Since the Mbendjele have no electricity and solar power can be unreliable under the canopy where they live, members of the tribe charge the phones using Hatsuden-Nabe cook pots from Japanese company TES New Energy Corporation. As the pots heat up over an open fire—while cooking dinner, for example—the heat is transformed into electricity that, conducted via a USB connector, powers the phone batteries. In general, members of ExCiteS use Esri software to do development and analyze data that helps inform their research. But the team is working on connecting the citizen data more comprehensively to Esri technology. To do this, ExCiteS developer Oliver Roick engineered GeoKey, an open-source web API used to save and access geospatial information in a format compliant with the Open Geospatial Consortium, Inc. It lets the various ExCiteS projects store data collected by Sapelli or other geospatial technologies, as well as translate remote sources of data, so they can be consumed by a number of GIS programs and applications. Currently, to import data into GeoKey from Sapelli, users must compress files exported from Sapelli and use an extension in GeoKey to import the ZIP files. Once the data is in GeoKey, users can visualize it in a web browser or a desktop GIS platform that can consume KML, GeoJSON, and CSV data, such as ArcGIS Online. In the future, however, transferring data will be done seamlessly from Sapelli, and additional data format outputs will be available in GeoKey. Moreover, as the platform's functionality increases, ExCiteS projects will be able to send GeoKey data directly to ArcGIS Online. "This will allow citizen data collected through our open-source platforms to be shared with those using Esri technologies, such as government departments and [nongovernmental organizations], for more informed decision making," said Rickles. While ExCiteS initially developed Sapelli for use by the Mbendjele, the team has begun making the technology available to other populations as well. "The pictogram decision trees in the application can be swapped out for other pictograms to facilitate its use by completely different communities," said Rickles. "It is currently being used by tribes in the Amazon by another ExCiteS researcher, Carolina Comandulli." Comandulli is working with an Ashaninka group living in Acre State, Brazil. Unlike the Mbendjele, the Ashaninka have a designated area of indigenous land that they manage, and they are using Sapelli to collect evidence of illegal intrusions onto that land. Because the Ashaninka have a strong tradition of drawing, they designed many of their own icons. The ExCiteS team is also working on other Sapelli projects in the Congo Basin that are currently in various stages of completion. In all cases, the platform plays a central role in the ExCiteS mission, which is to develop theories, tools, and methodologies to enable any community, anywhere, to engage in citizen science.